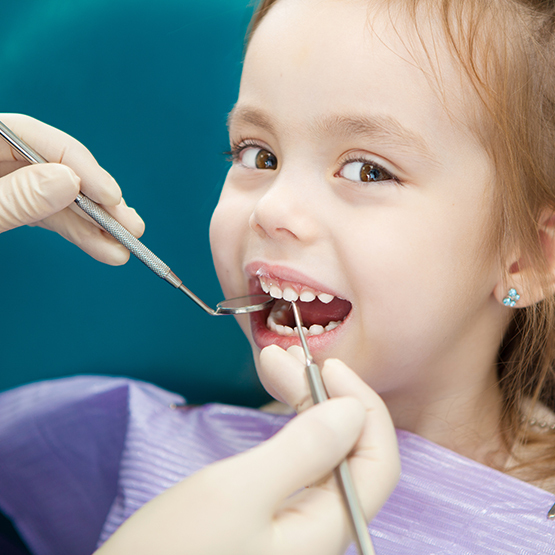 Pedodontics or pediatric dentistry involves with the oral well-being of your children. We have professionals who are highly capable of treating your precious little ones with pain-free laser dentistry. Although baby teeth are eventually replaced with permanent teeth, healthy baby teeth are fundamental to a child’s overall health and development. At surabhi dental we strongly advise & encourage parents to get their children for an oral assessment from as young as 6 months old. It will help your child to become familiar with the dentist and gives us a chance to develop a long lasting doctor-patient relationship without the risk of dental fear later in their life. Early oral assessment will evaluate the different elements of your kid’s smile and long term solution for their oral development. If you think your child is too young to need root canal treatment, think again — there is no age limit for this treatment. If his/her primary (baby) teeth have been injured, or if decay has advanced deep into the roots of your child’s teeth, a root canal treatment to stabilize teeth may be needed. Root canal treatment removes the infection from the pulp, the living tissue that is found inside the tooth’s roots. The pulp contains the tooth’s nerves, so tooth pain is often an indication that decay has moved into the pulp. Root canal treatment is a simple procedure wherein instruments are used to clean the root canals of teeth followed by inserting a medication so as to maintain the teeth properly in the oral cavity. Frequently children acquire certain habits that may either temporarily or permanently be harmful to teeth and tooth supporting structures. These habits are acquired as a result of repetition. In the initial stages, there is a conscious effort to perform the act. Later the act becomes less conscious and if repeated often enough may enter the realms of unconsciousness. Some common oral habits seen in children include thumb sucking, mouth breathing, tongue thrusting, lip biting, grinding of teeth and nail-biting. Certain reminding appliances called habit breaking appliances assist the child who is willing to quit the habit but is not able to do so as the habit has entered the subconscious level. They may be removable or fixed appliances. WHY IS CHILDREN’S DENTISTRY IMPORTANT? Humans start teething when they are as young as 6 months old and develop their set of primary ‘milk’ teeth. At the age of 6-7 years, humans start losing their milk teeth and the permanent set of teeth start emerging. Because the milk teeth will eventually fall off, some parents tend to ignore taking their child to a dentist. However, these milk teeth form the basis of developing permanent teeth. If proper care is not taken the problems can emerge which will last a lifetime. In recent years the cases of caries in children have grown manifold. Therefore, it is always advised to start taking care of your baby’s teeth in the very early stages of their life. This includes setting Oral Hygiene routine and regular visits to pediatric dentist. A common problem for which parents usually take their children to the dentist is decay. This is because there is a lack of proper dexterity of brushing in children. To avoid the problem of decay, parents should get the Fluoride application treatment in children at regular intervals. Fluoride helps to fight plaque and bacteria which can cause enamel loss which further causes cavities. Fluoride also strengthens the tooth structure & helps in bone growth. Under this treatment, the dentist incorporates fluoride ions into the tooth structure making them more prone to acid dissolution. This treatment is equally useful for both milk & permanent teeth. The main reason for decay is the food and bacteria that is trapped in the pits & fissures of teeth. We chew food from the back teeth like molars and premolars which are never flat. The pits & fissures as discussed above are the depressions on these back teeth. They function as potential traps for bacteria & food and make it susceptible to decay. Therefore, as a preventive measure, certain pits and fissure sealants are placed. Dental sealants then come to the rescue. Sealants are plastic coatings placed on the chewing surface of the permanent tooth. They protect the tooth from decay. Because of fissures the permanent back teeth, molars, and premolars are vulnerable to decay. As we talked about the habits, it is important to inculcate the habit of maintaining good oral health at a very initial stage. This is an investment which will pay lifelong dividends in the form of healthy teeth and a healthy lifestyle. Parents should take initiatives to teach their children the correct technique of brushing and for that, it is highly important that they themselves should know the correct way of brushing. Make brushing a fun-filled activity for your child, brush along with them and encourage them to take preventive actions. Q.1. What Is The Minimum Age Of Visiting A Kid’s Dentist? One should take their child to the dentist as soon as the first tooth erupts or when your child turns 1. Q.2. How Long Should A Child Visit A Pediatric Dentist? The age ranges from 0-18 years. The time till he/she turns into an adult. Q.3. 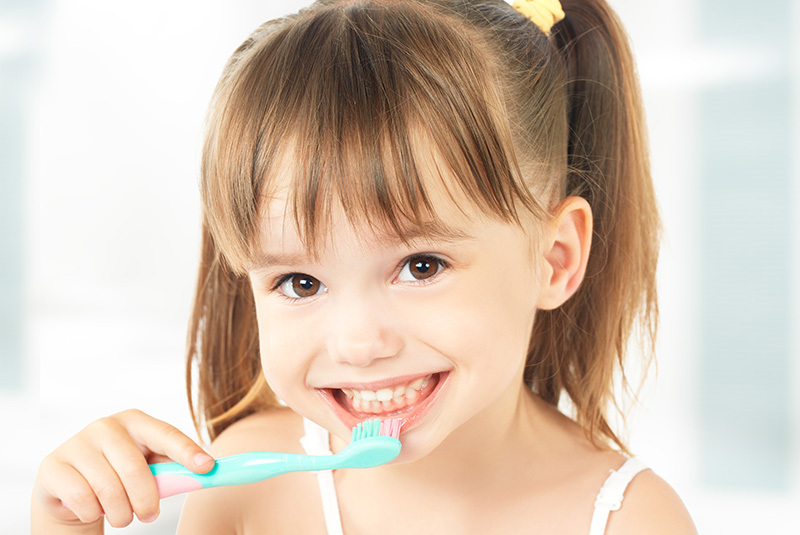 When Should A Child Start Brushing? As soon as the first tooth erupts but make sure that the amount of toothpaste is not more than a grain of rice. Q.4. Should Mothers Clean The Mouth Of Babies If There Are No Teeth? Yes, it is important to keep the mouth clean. Clean the upper and lower gums with a soft cloth. Q.5. Is It Normal For Babies To Have A White Tongue? Most of the babies have a white coating on the tongue in the early weeks and is very normal. Q.6. What Is The Importance Of Milk Teeth?